Four poster beds are the center of a bedroom: the large size of a four poster bed, together with the height of the pillars, makes the bed the focal point of the room. The linens chosen for a four poster bed are a fundamental part of styling the space. A traditional four-poster bed works well with shades of cream, peach and pink. There are many styles of four poster bed including modern styles, beds fit for a traditional taste and beds suited for exotic designs, such as those found in beachside resorts. Antique four poster beds work well with a romantic-inspired space. Keeping the rest of the room simple yet woven into your central theme makes for a successful four poster bed decor experience. A modern four poster bed is typically a darker wood or black paint/stain and has clean lines. Some modern four poster beds may have a circular pattern: the bed posters resemble wooden circles mounted on top of each other. The four posters of the bed and the bed itself represent the simplest, most minimalistic of styles and work best with clean, simple linens such as a crisp white duvet and a few throw pillows in carefully chosen pops of bright, modern color. A traditional four poster bed has a fancier appeal and typically has dark wood, similar to the modern bed. However, the four posters and the bed itself are look fancier than the wood of the modern bed. A traditional bed has wood with more detail in the wood carving and the actual stain is often a cherry or medium brown versus an espresso or black tone, as seen in the modern bed. 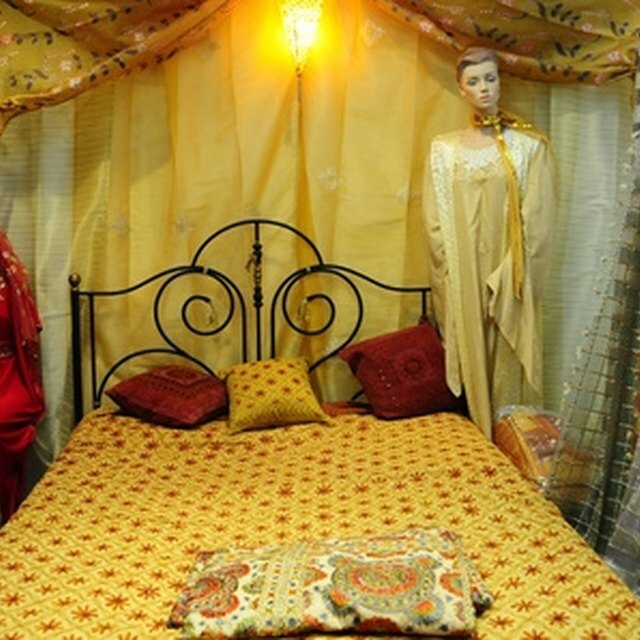 Potentially made of bamboo or another exotic wood, an exotic four poster bed works well with Indian linens and quilts. This type of four poster bed is typically imported and can be sourced through a specialty furniture shop or specialist in luxury furniture. Given the cost of importing, this bed is on the higher end of the price point. Adding lots of pillows to the bed and complementary floor cushions on the floor makes your bedroom resemble an oceanside retreat, anytime of the year. An antique four poster bed, in brass or in an antique wood, works well with a romantic design scheme. Pair this style of bed with assorted textured bedding including pillows, sheets and blankets in satin, lace, velvet and linen. The textured layers add a romantic, old-world sense to the space and also feel heavenly during periods of rest and relaxation. Add a few candle holders to the bedside table and you've created your own romantic retreat. What Are the Dangers of Detergent on Food?